It was bound to happen sooner or later. 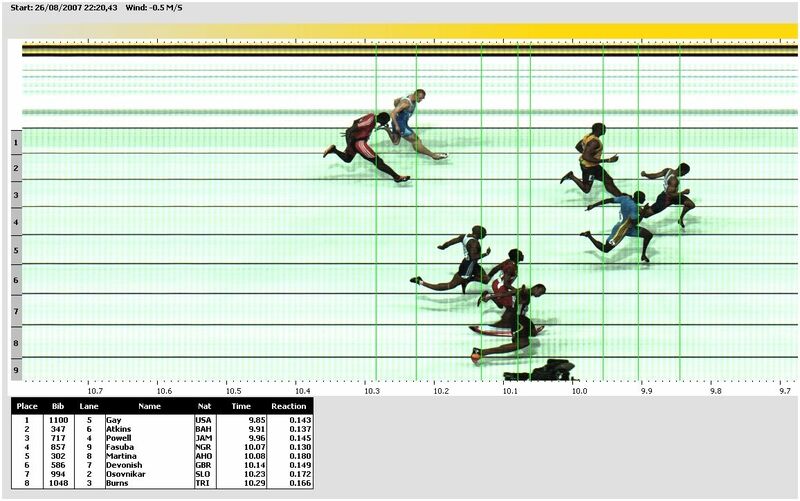 There had already been races decided on meagre hundredths of a second, and now we have an example of a race which has been decided in three thousandths of a second in the men’s 1500m which happened just last night. While chatting to a friend after the race, I was asked the simple question of “knowing all you know about the timing equipment, is this fair?”. To which my genuinely-held belief was “yes, it is”. However, after a long and fairly detailed discussion, he changed my mind. I shall present all the information and arguments we considered below, and I would be VERY interested in people’s thoughts on the matter. First, the current situation. The starter’s instructions are “go to the start”, “ready”, then the gun. The starter won’t fire the gun until both skaters are perfectly still. If there is any movement before the firing of the gun, then the skaters will be called back for a false start. After one false start, the second false start *regardless of which skater is responsible* results in a disqualification. The starter’s pistol is electronically connected to the timing equipment. When the skaters cross the line, the time is recorded. 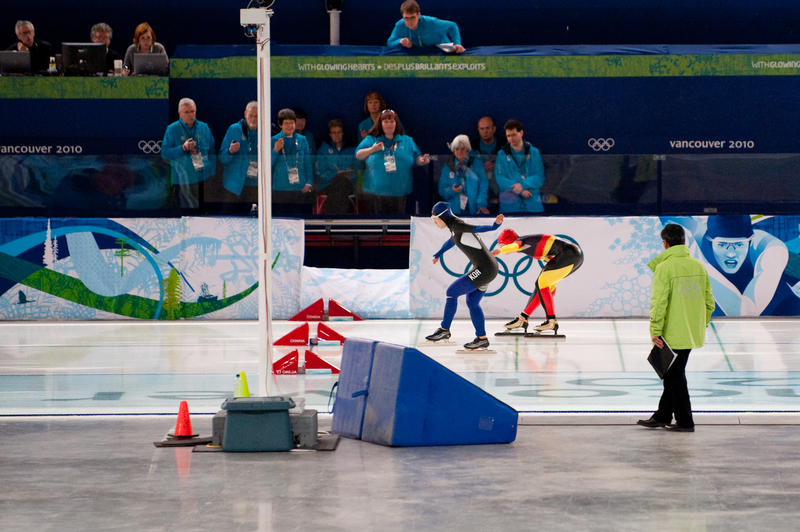 As a matter of practicality, the scoreboard and TV feeds are connected to the electronic beam (you can see the beam boxes in the photo above, protected by the red cones), the sensors for which can be seen at the finish line, but the “official” time is measured by the Lynx camera. At any ISU (International Skating Union) sanctioned competition, there must always be a third backup, usually a pair of transponders worn on skater’s ankles, or at lower-budget competitions (basically anything that isn’t on TV) hand-timing. The Lynx is a special kind of camera with a lens and a slit aperture and it photographs a narrow slit of the world (rather than a 2-dimensional plane, which is the norm for cameras) over time. When you look at a photo finish, what you’re actually seeing is a graph of what was on the finish line at what time. The x-axis is time, and recording a skater’s time is simply about drawing a line corresponding to the forward-most part of the blade still on the ground (kicking at the finish is against the rules and can get you disqualified). This is a photo from the 2007 Athletics World Championships in Osaka (click on it). You can clearly see the time along the bottom. Modern finish camera technology resolution has improved, and thousandths are easily discernible. Curiously enough, these finish line cameras used to be ‘analog’ (using film), and have been more accurate than electronic beam timing for a long time. Nowadays with digital imaging technology, and more advanced electronics these system are very accurate, able to measure much smaller margins than thousandths of a second. The problems which occasionally crop up are mostly due to unexpected practical problems. Sometimes a wayward armswing can obscure the camera’s view of someone’s skate, or a reflective blade can reflect the finish line beam at precisely the right angle so as to not trip the sensor. This is why there must always be a third backup. The transponders are a technology which has come of age relatively recently. Previously, they’ve lacked the kind of pinpoint accuracy necessary for long track, but have been used mostly for large pack-style races because they’re very good for determining positions in a large pack of skaters. They work by a system of triangulation with wires embedded in the ground, usually at the finish line, but in modern venues, all around the track. When you’re watching the TV coverage, when they show real-time speed information on the skaters (usually in the bottom right corner of the screen), that information is coming from the transponders. The electronics have advanced sufficiently to measure very accurately the position of the transponders – that’s the only ‘problem’. Inferring the position of the skate from the position of the transponder is essentially a guess. It’s a very good guess, but it’s still a guess, which is why it’s the third backup. So that’s how timing works in long track speed skating. Think about how small a margin three thousandths of a second is. When you slow down time to that scale, the world looks completely different. If you’ve ever stood at the other side of an ice track from the start line during a race, you’ll already know the first potential problem – sound. It travels at about 340 meters per second. That means that sound only travels about a meter in three thousandths of a second. The lanes in speed skating are exactly 4 meters wide. That means that the skater in the outside lane potentially has a hundredth of a second advantage over the skater on the inside lane. Something you may also have noticed about the skating at the Olympics is that they don’t use a real pistol. The sound of the starting gun comes out of speakers which are placed at equal distances from the skaters (we hope). Luckily, the speed of light is sufficiently fast that we don’t have to worry about the distance skaters are from the finishing line camera. Then there’s the reaction time of the skater. “Wait a minute”, I hear you say, “that’s a matter for the skaters, and their responsibility”. It is, but it also isn’t. There’s a well-established theory that a human will react slightly faster to the gun if held on the line for a long time, than if they’re held for a shorter time. This seems counterintuitive, but the result is surprisingly robust. A scientific paper which documents tests (performed on actual Olympic speed skaters) on whether this applies to speed skaters is currently in the process of being published, and I have a feeling that when it is, there will need to be a significant reworking of the standard starting procedures. If there is significant variation which can be accounted for by starting procedure (and it only has to be greater than a thousandth of a second to be ‘significant’), then it would be unthinkable not to revise the starting procedure. And finally there are variations in the conditions. In the age of modern indoor tracks in climate controlled buildings, this effect seems to be negligible, and for the most part it is, but could these slight variations account for three thousandths of a second? Of course they can, and of course they do, to the tune of as much as a few hundredths of a second. So this is the dilemma – how fair is it to separate the performance of two athletes based on the margin of three thousandths of a second? With a margin that small, how can we be sure that the difference is accounted for by a difference in their ability to skate the distance? I have enough faith in the timing equipment and methods to be very sure that Brodka did in fact skate the distance three thousandths of a second faster than Verweij, but I cannot be sure that the difference was because Brodka was really 0.028% faster than Verweij or because of very slight variations in air and ice conditions over the course of the event. This is not to take anything away from the achievement of Brodka, but in all honesty I believe that both athletes should be given the gold medal. But like the margin itself, this is a close decision. One could just as easily argue that these small and essentially random variations are part of the game, and that minimising randomness should be a priority, but should stop short of declaring two equal Olympic champions. Indeed, many factors which are quite outside of a skater’s control contribute to any race, and most of them are impossible to account for, or limit. Should this also be reflected in widening the margin over which we consider performances to be “equal”. I would be interested to hear your thoughts on the matter. Don’t forget to click the sochi2014 tag to read my other articles on the olympics, and also to check out the other ‘specials’ on speed suits, the differences between long track and short track, and why the US complaints about their suits were nonsense. Means of measurement should be proportional to what is being measured. I agree with you. Our high capability with time is beyond the detection of our human senses – sight, hearing. When we are measuring human performance we should stay within that range. It’s okay to have ties. Interesting piece, also interesting to know that the timing of the skaters waiting for the shot influences their reaction time. As you said, the lanes are roughly 4 meters and with both riders standing i n the middle of their lane it means that the rider in the inside lane is about 4 meters more distant from the speaker than the rider on the outside. This equates to the rider on the inside hearing the starting signal 12 thousands, or more than 1/100th of a second later. This is quite significant and makes the judging of time on thousands of second, apart from other reasons already mentioned by you, quite unfair. Is there a picture of how far apart they really were? I’m interested to know since I remember during the short track seeing a couple of photo finish pictures where the difference in time was thousandths (for example, see 1500m quarterfinal #4, won by Charles Hamelin), and the distance was larger than I thought it would be. In that particular race, Charles was ahead by 0.001s and it turned out to be a difference of about 10 cm (if I remember correctly). Seeing as long trackers are generally going faster than short trackers, a difference of 0.003 might be larger in terms of distance than you might think. I suppose it doesn’t really address the issue of whether the difference is due to not hearing the gun fast enough etc… but still food for thought.